You are in an ARD meeting, it's 2:00 pm and you know there's a parent phone call you HAVE to make before the bell rings and there's a teacher who needs your support with a student and the last time you checked your email, right before going to the ARD, you noticed Inbox 64, and you just got a call on your radio that there's ANOTHER cockroach in the staff restroom but this time it's on it's back and it's legs are still moving and it is making attempts at flipping over and it seems like it's figuring out the flip or at least it's about to and if you don't get there super fast it's going to run off and create new little cockroach babies and we ARE. ALL. DOOOOOOMMMMEEED!!!!!!!!!! With all that going on, it's hard to ATTEND to the meeting the way the students and parents deserve for you to. It's hard to be present. I find myself thinking about this all the time and I'll tell you why. 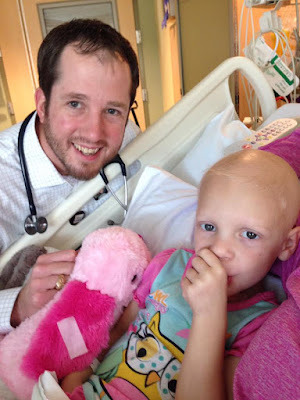 My daughter Avery, who was diagnosed with cancer at the age of two, was essentially assigned an oncologist. It's not like we got to pick her doctor out of a menu of doctors at the local Children's Hospital and it's not like we would have been able to even do that at the time - our brains were a bit jumbled. Anyways, we were very lucky that Dr. Andrew Martin at UT Southwestern was assigned her case and about a year and a half into her treatment, after countless meetings and mulling over different plans, my wife and I commented to each other nonchalantly on the way home from one of those meetings how patient Dr. Martin is with us. When you are trying to figure out the best path to saving your child's life, there are a lot of questions from the parents, trust me on that one. He NEVER seemed like he was in a hurry, even though he probably had multiple other families waiting in various rooms to speak with him. He NEVER grew impatient from my questions. He always attended to those meetings, 100%. During that time, we were his number one priority and we needed to be someone's number one priority. We had to meet with other doctors occasionally, surgeons, fellows, ER doctors, other oncologists while Dr. Martin was out of town, etc. They weren't all like that. We needed to be heard. We needed somebody to hear us and to attend to us 100%. How many of our parents notice when we aren't attending to them 100%? All of them. Think about how powerful it would be if they knew they were our only concern for that 45 minute meeting? They need somebody to hear them and attend to them 100%. Thank you Dr. Martin for never being in a hurry, even though we are sure you were. We noticed your patience. We noticed your willingness to hear us out. Thank you for your 100% attention and thank you for loving our daughter!